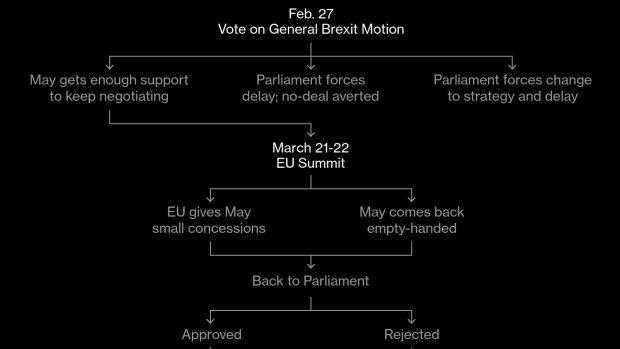 (Bloomberg) -- U.K. Prime Minister Theresa May is expected to fail in getting a new Brexit deal by next week. Pound traders couldn’t be happier. Options markets signal investors are the most bullish on sterling’s prospects in five weeks as speculation grows Parliament will move to take control of the process, delaying Brexit and heading off a chaotic exit. Strategists see the pound being supported if lawmakers take steps to force the government to request an extension to negotiations, with the pound likely to rally to $1.33 if politicians vote for such a move, according to MUFG. Sterling has rallied this week amid reports saying the U.K. and EU were attempting to come to a compromise over the contentious Irish border backstop. May has pledged to let lawmakers vote on Wednesday on what to do next if she is unable to secure changes by then. Amid the improving sentiment, pound risk reversals, a gauge of relative demand for bullish or bearish options, show traders now have to pay a premium to own upside exposure in sterling over the one-week tenor. The measure closed Thursday above parity for the first time since mid-January. While he is bullish on the currency’s prospects, Investec Asset Management portfolio manager Russell Silberston said he is opting to maintain a small long position given the high level of uncertainty. The pound could gain to $1.3300 if Parliament passes an amendment seeking to delay Brexit, or it could drop toward $1.2840 if Parliament doesn’t agree on any of the available options, according to MUFG currency analyst Lee Hardman. In other developments next week, Bank of England Governor Mark Carney is scheduled to speak at a hearing of Parliament’s Treasury Committee on Tuesday, along with Deputy Governor Dave Ramsden, and fellow policy makers Jonathan Haskel and Gertjan Vlieghe.